This Safety fencing is manufactured from durable polypropylene and is able to withstand the sun without fading. This visual barrier warns other people from danger or a prohibited zone. Erecting the barrier fence is extremely easy, just insert steel rods in the ground and weave the mesh over it. The strength of the mesh becomes evident by its long term lifetime and the UV resistance. Interplast Safety Fencing is manufactured in highly visibility orange color from virgin grade polypropylene. The safety fencing mesh is manufactured up to a width size of 1,2 meter high (standard) and in lengths on 25, 50 or 100 meters. Upon request, Interplast can produce longer lengths. It creates an instant barricade for road works, construction sites, car parks, sports events etc. Can withstand extreme sunlight and rain, making it a perfect product for outdoor in all extreme weather conditions. Available in various lengths .Interplast barrier fence can be reused over a long period of time. 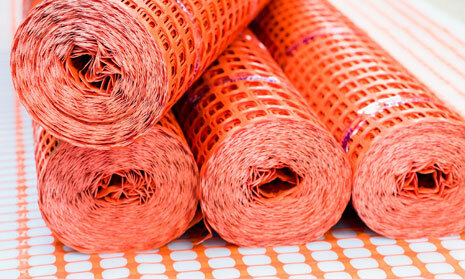 Interplast safety fencing is manufactured in highly orange colour from premium quality polypropylene the safest fencing mesh is manufactured with a width of 1.2meter (standard) and in lengths of 25, 50 or 100 meter roll. Each roll is supplied in supplied in a shrink rapped protecting film. Upon request, Interplast can produce longer lengths to suit project requirements.